Six lawyers at Burnetts have been promoted this month, including two West Cumbrian solicitors. 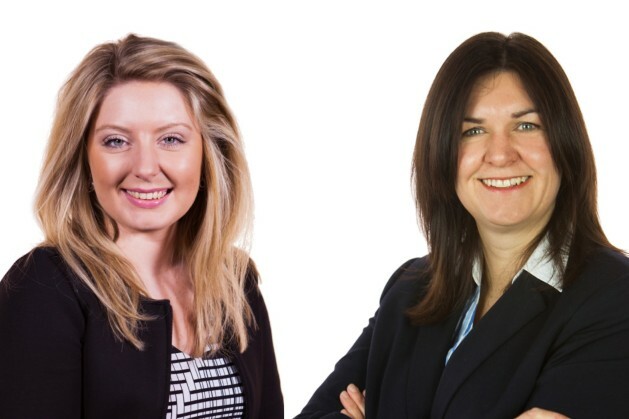 Following a year in which over £30 million worth of damages was secured for brain injured children, Jayne McCluskey (pictured above right) from the firm’s Medical Negligence and Serious Injury team becomes a Senior Associate. Jayne attended Whitehaven School and returned to West Cumbria in 2014, having completed her solicitor training in 1998 in Liverpool and worked in the South East for more than a decade. During 2017 Jayne was re-accredited to the specialist panel of AvMA (Action against Medical Accidents), the UK charity for patient safety and justice. She is the only solicitor in Cumbria to be both accredited by AvMA and a member of the Law Society’s Clinical Negligence Accreditation Scheme. Since 2011, she has also been recognised as a Senior Litigator by APIL, the Association of Personal Injury Lawyers. Corporate lawyer Melissa McManus (pictured left) has been promoted to Associate after a year in which she has received consistently excellent feedback from clients who frequently praised her dedication and knowledge. Originally from West Cumbria, Melissa attended St Benedict’s High School and Sixth Form in Whitehaven. Now living in Carlisle, Melissa is also a professional mentor for the University of Northumbria where she completed her Legal Practice Course before qualifying as a corporate and commercial solicitor in 2013. She joined Burnetts in 2016. Also promoted in Burnetts’ New Year review was Head of Dispute Resolution James Johnston who becomes a Partner. Solicitors Hannah Fitzpatrick and Megan Richardson and Chartered Legal Executive Caroline Manningham are promoted to Associate.